The Northumberland Foundry | Launceston Then! The Northumberland Foundry was founded in the early 19th Century by William Langdon. The building was 68 feet by 30 feet, included Smith’s and Fitting shops, Grinding shed and Engine house. There was office at the entrance to the works; large Store, with Pattern Loft over; Coach House and Stable, with lofts over, and a large yard (enclosed) between the foundry and stable. 1 WATER WHEEL, 17 feet high and 7 feet wide; do. Do. 12. Do. and 2 ft. Wide. Stamps, Axle, and Tongues; 18 Stamps heads, with Wood Lifters; Stamps Frame, and Guides, & c., & c. Also several Wind-bores, and Matching pieces. Northumberland Foundry, St. Thomas, Launceston. It was later bought by John Box and the following two generations of Box’s continued to run the business until it was sold off by John Box’s grandson, Arthur Box in 1912. It was purchased by long time employee’s C & W Hillman. Cornish & Devon Post & Western Counties Advertiser, Saturday April 4, 1896. (named after the Duke of Northumberland, who one time owned Werrington Park), St Thomas, the proprietor of which (Mr AW Box), as is well-known, is quite a genius in many ways. Our representative on presenting himself at the office door, found that it was not exactly “put a penny in the slot and you get your photo”, but press the button, the door opens by some mysterious means, and you gain admission at once to the show room without anyone coming to the door, and then you go up into the bright, cosy office above, where the worthy head kindly receives you. This open sesame is done by Mr Box as he sits in his chair above, by means of a lever which pulls back the catch on the door. To use an Americanism, Mr Box is very keen on electrical appliances. Immediately behind his desk he has also a telephone connected with the dining-room of the dwelling house, the working of which he minutely explained. Then again an electrical signal calls any of the workmen up from the foundry. When quite a lad Mr Box made an excellent telephone, so that he is no tyro in the management of such a contrivance. In fact, he is often consulted by Launcestonians and others on this and kindred matters, and is always ready to give the most kindly assistance. In the conversation, he was also exceedingly interesting in his remarks on motors. When he undertook the management of the foundry the motive power was supplied by a steam engine, which had been a faithful servant for many years. On this one being past further use, he decided to be well up to the times, and after careful consideration secured one of Crossley’s oil engines, of 4 horse power nominal, capable of developing 30 horse power, he being one of the first purchasers of this new invention. After a fair test, he says the engine is a decidedly good one, and works the fan and machinery without the least trouble. Mr Box contemplates erecting the electric light on his premises, this engine being well capable of supplying the power, and I have not the least doubt that he will do it, for his ingenious contrivances in all direction at once convinces you that he knows nothing of difficulties. Mr Box has also been considering a water motor, believing that he could thus obtain 15-horse power without any difficulty. No doubt Mr Box’s inventive mind will develop the idea at some favourable opportunity. In fact, a certain gentleman of this town, who at present uses an engine, has been considering with Mr Box the advisability of trying the use of water for motive power, now that we have a plentiful supply available. Mr Box is also an exceedingly good amateur photographer, and turns his knowledge and gifts to a practical use, photographing patterns and other things connected with the trade which it is advisable to have in possession. Such a mind naturally finds full scope in a foundry where all kinds of inventive work has to be carried out, and is the necessary “motive power” to make such an institution successful. The Foundry was established several decades ago by the present proprietor’s grandfather (Mr John Box), who had a business in Broad Street. It was he who built the present bone mill at Ridgegrove for a foundry. After his death, his son, Mr WB Box, father of the present proprietor, carried it on for three years, and then sold the business to Mr Langdon, who removed from Ridgegrove to the present premises. On the latter’s demise, his son carried it on, the business eventually coming into the hands of Messrs Henry and Edward Box, second cousins to Mr AW Box. They, about ten years ago, dissolved partnership, and Mr AW Box then came down from London and bought off the foundry established by his grandfather so many years before. It is worthy of mention that this Mr John Box+ was also a clever clockmaker, and several clocks bearing his name are still to be seen in the district, while his son, Mr W Box, when a young man, constructed entirely himself [it being three years’ labour] a very fine model of a working steam engine*, which was exhibited in the Western Rooms some sixty years ago, the maker giving a lecture on steam power, then, of course, in its infancy. This brought him into communication with Sir Goldsworthy Gurney, who invented the Bude light, and was at that time working on his steam carriages; and, acting on his advice, Mr Box went to London, where he was very successful as a watch and clock maker. On his arrival at Launceston, Mr AW Box soon set about making several beneficial alterations to the premises, including an enlargement of the foundry, all of which showed the design of a practical hand. Cornish foundries are handicapped in that the men are unable to work piecework on account of the great variety of articles to be made. In the larger foundries in the North the case is different. An order for stoves, for instance, is often sufficiently large to keep men at work for weeks together. Then the advantage of being able to put men on piecework is clearly proved, and the profits much more easily gauged. The men in this foundry are chiefly employed in making the castings used by agricultural implement makers and machinists, comprising the parts of water-wheels, pulleys, pinions, gear-wheels, plough bodies, grutices, shoes, shares, etc., etc. In fact, on seeing the countless patterns piled on the shelves, one is convinced that next to gold, iron is the most useful metal. In the Northumberland Foundry kitchen ranges are the only articles made completely and stocked, and Mr Box has given his particular attention to the manufacture, so that they should give a maximum of heat with a minimum of fuel, and as the parts are constructed of extra stout plates the stoves last for many years. Mr Box also supplies stove castings to several makers who are not founders themselves. On a recent visit, we noted castings going off to St Austell, ordered by a noted electrical engineer there. It is most interesting to see the large blast furnace set to work, and the liquid iron run out into the numerous moulds on the foundry floor of a given day of the week. The day for casting is Fridays, and in about two hours the moulds that have taken all the week to prepare can be filled with the melted iron. The mould is made in sand and coal dust [the latter being ground down in a mill for the purpose] by means of what is called a pattern, made either of wood or metal. These patterns [some of considerable value] are always kept in stock, so that in case of breakages new pieces can be speedily cast. A visit to the pattern store gives one some idea of the capital that is needed, and the great part this foundry played in the more prosperous days of Cornish and Devon mining, huge patterns of cog wheels, cranks, eccentrics, gratings and all the adjuncts of water wheels and other machinery being packed away, the accumulation of scores of years, but ready for the quickest reproduction. In the centre of the foundry a huge crane is erected for use when heavy pieces of metal are required, such as the target which Mr Box supplied the Launceston Volunteer Corps. Mr Box uses only the best pig iron to be obtained in Scotland. This on being melted is allowed to run out of the furnace in required quantities into a ladle with long arms extending on each side. This two men immediately carry it round to the moulds and pour it into holes made for the purpose, until it is known they are full, the bubbling liquid that rises in certain places giving such signal. The castings are taken from the moulds the next day, and then go through a process of finishing with lathe, drill and other machinery, there being separate departments for this work, it being one of Mr Box’s privileges to have plenty of room. From all I saw, I am quite convinced that there is a still more prosperous future for the Northumberland Foundry, and that it is one of the most valuable institutions Launceston possesses. + Clocks made by Mr Box may still be found; the Lawrence House Museum, Castle Street, has a long case. * The ‘Steam Engine was in fact a model of a steam water pump, as used in mining; this is also in Lawrence House Museum, sadly only driven by a ‘Kenwood mixer’electric motor. Mr Langdon built the woollen works on the site of which the foundry stands, later to become Mr Hague’s mills. Cornish & Devon Post, 13th January, 1912: The Northumberland Foundry: For Sale. TO BE SOLD as a going concern, the above business, which has been carried on by Arthur W Box, for the past 25 years. The business is of long standing, having been established more than a century ago by John Box, grandfather of the present owner. For the past fifteen years Mr Salloway has acted as manager. The business is well known throughout a radius of 20 miles, and there is also a London connection. All kinds of casting can be turned out and Kitchen Stoves have been a speciality and for which excellent testimonials have been received. The premises are situated quite close to the Great Western Railway terminus station at Launceston, and also to the London and South Western Railway station. 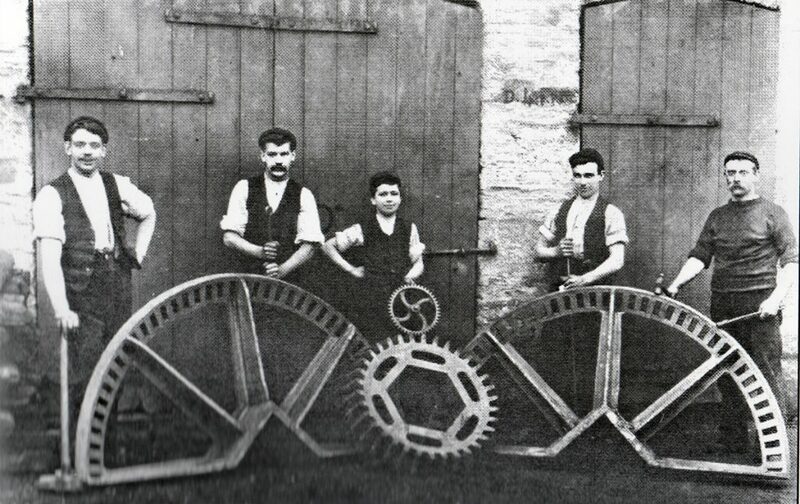 The Plant comprises: a Crossley oil engine, 4 hp., nominal; lathe, 12 ft. gap bed, 7½ centre screw, cutting and surfacing, with 22 change wheels; small lathe, with divided head and a slide rest; Drilling tool, 6½ cwt. for power and hand pulleys and shafting; a mill for grinding coal dust; smith’s bellows, anvils, stocks and dies, and various tools. Furnace for smelting iron, fan, large stove for drying cores, grindstone, corundum, grinder, large crane, moulding boxes, large quantity of iron and wooden patterns, etc., etc. The Premises would be Let for a Term at a reasonable Rent, or the Freehold would be Sold.